The young universe was full of bright young things, with new stars being born at an incredible rate – much faster than today. In the midst of this fervor, astronomers have discovered a galaxy that has already burnt through all its fuel. The discovery, reported in Nature, is unexpected. These “red nuggets” were believed to have formed at the earliest 3 billion years after the Big Bang, but this object, known as ZF-COSMOS-20115, was already red and dead when the universe was just 1.65 billion years old. 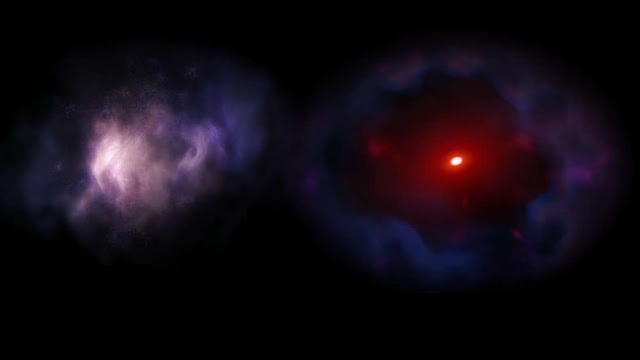 "This discovery sets a new record for the earliest massive red galaxy," lead author Professor Glazebrook, from Swinburne University, said in a statement. "It is an incredibly rare find that poses a new challenge to galaxy evolution models to accommodate the existence of such galaxies much earlier in the Universe." The galaxy is found in an epoch when galaxies are seen to form hundreds of stars per year, yet it is barely forming a star the mass of the Sun every five years, five times less than the Milky Way today. But the researchers think that when it assembled, 950 million years after the Big Bang, it was producing 1,000 new stars every year. "This huge galaxy formed like a firecracker in less than 100 million years, right at the start of cosmic history," Professor Glazebrook added. "It quickly made a monstrous object, then just as suddenly it quenched and turned itself off. As to how it did this, we can only speculate. This fast life and death so early in the Universe is not predicted by our modern galaxy formation theories." More observations are necessary to understand objects like ZF-COSMOS-20115. When the powerful James Webb Space Telescope launches in 2018, it will be sensitive enough to find a lot more of these early galaxies that lived fast and died young.